2 bedrooms, 1 full bath, sleeps 5, private yard, front and back decks. Book this charming cottage now for your summer 2018 Cape Cod Getaway!!! Cozy cottage only 4/10 of a mile to the beach! Private, fenced back yard, 2 decks, outdoor shower. South of Lower County Rd, walking distance to the Dog House (delicious hot dogs!) Chapin's (Formerly Clancy's), and other local restaurants. Convenient access to Rt. 28 attractions and just a few miles to Rt. 6. 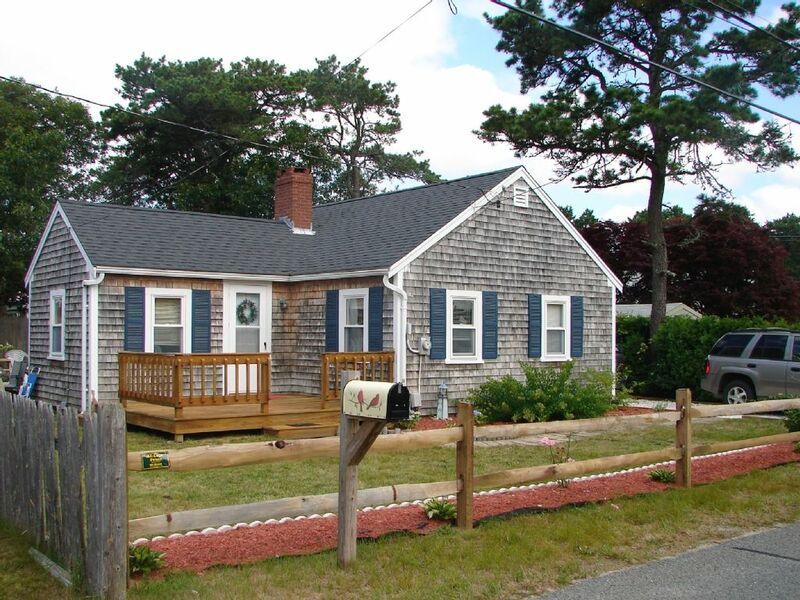 Cottage updated by owners looking to share the Cape Cod experience. This is a true Cape Cod Cottage! Beautiful Glendon Beach just 4/10ths of a mile away! Close to many attractions (restaurants, kayak rentals, bike path, shopping, mini golf, etc.) just minutes away!! The cottage was clean and tidy with all the things that we needed to make ourselves comfortable. Unfortunately, we had a week of bad weather but the ocean was less than a 1/2 mile straight walk from us and we managed to get there on a morning walk without getting too wet. One sunny afternoon took us to the West Dennis beach close by and that was great. The cottage had nice hot water and we found games, cable tv and wifi to amuse ourselves when it rained and rained and rained. The property was also very well maintained and we were able to sit out and enjoy it a few times. The location was very convenient to both old and new attractions. Overall, A very nice place to stay . We had a wonderful stay at your cottage - everything was as described. Dennisport is centrally located making it easy and convenient to explore all of Cape Cod. Due to the time of year we visited, some of the restaurants were closed, but there were so many other excellent options, it didn't make one bit of difference! Robert and Jennifer were very attentive throughout the entire booking process which made me feel like I was making the right choice in cottages. Thanks again for sharing the cottage with us! This cottage is very cozy and everything was clean and ready to enjoy. Couldn't do much about the weather, but was able to enjoy sitting out on front/back deck a few times. Cooked out on the grill and just relaxed after spending time on the beach. Location is very convenient to the little deli store, the beach and local restaurants. Morning walks around the area were the perfect way to start each morning. Would definitely recommend this place. The owners were quick to respond to any questions we had. It was a very easy rental process. Only concern was at the end of the driveway the bushes are overgrown and had to be super careful pulling out to the road. In fact, one of us would stand outside to make sure no traffic was coming our way. This location is great for all local attractions. Within a 10 minute walk to the beach. The house is very cute. It's a little hard to get airflow in there during the humid days, but they have a lot of fans for comfort. Owners were very responsive to emails and texts when necessary. Love the back porch and outdoor shower. Supplies of beach chairs and boogie boards were a very nice touch. We're glad you had a great week at our cottage! Cottage is traditional Cape Cod, very attractive, with lovely private garden, and a deck back and front. It’s only a few minutes walk from a sandy beach, and is also an ideal base for exploring the rest of Cape Cod. We cooked most evenings, and there is plenty of kitchen equipment. Disappointing that cleanliness was only on the surface, the cottage could do with a proper clean, for example there is significant mould buildup in the shower, and corners and baseboards of rooms seem to have been missed for some time. The double bed is comfortable but the threadbare mattress cover needs to be replaced. It has the impression of being cleaned quickly by guests at the end of each rental but apparently a cleaner goes in. Thanks for your feedback on our cottage. We will speak to our cleaning service about the spots you mentioned and also replace the mattress pad. We’re glad you enjoyed your time at our cottage and on the Cape! Our cottage is near to all your Cape Cod vacation needs! Paddleboats and kayaks to rent less than a mile up the road. Beautiful Glendon Beach just a short walk from the cottage. Restaurants, movie theatres, shopping, mini golf, arcades, batting cages, etc. right up Rts 28 and 134. Easy access to Rt 6 to take you to Chatham, Truro and Provincetown. Cape Cod bike path/bike rentals right on Rt134 and only a couple miles from the cottage. Don't forget The Christmas Tree Shop and Cuffy's! A trip to the Cape isn't complete without a stop at these landmarks!